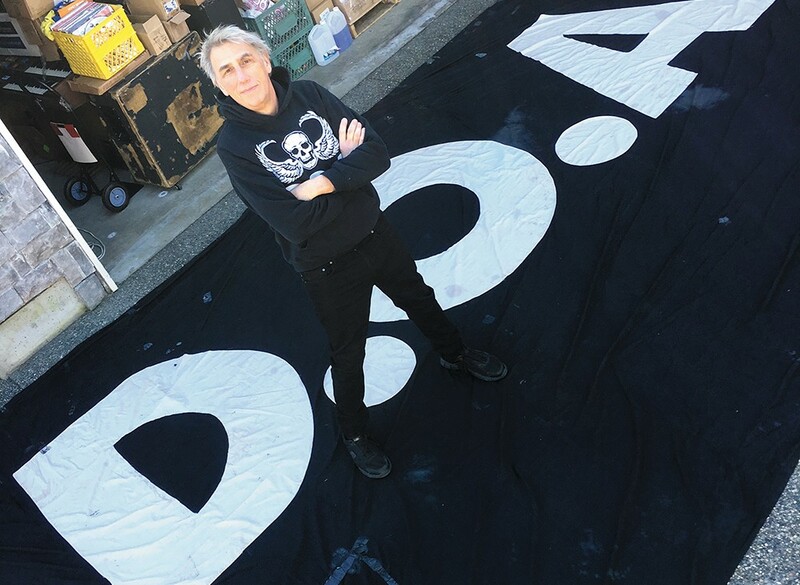 Joe Keithley poses with the fabled D.O.A. backdrop. Joe Keithley and his longtime punk band D.O.A. have been hitting places like the Pin in downtown Spokane since the '80s. Keithley had just finished a gig at the venue the night of June 16, 2018, when half of the band left to go stay with some friends down the road. But longtime band leader Keithley and D.O.A. 's roadie stayed behind at a local hotel. Before calling it a night, Keithley went to their van in the hotel's parking lot and noticed something was off. It took him a second to realize what he was looking at. He saw that the back window on the van's double door had been smashed. Worse, about $6,000 worth of stuff, including merchandise, a snare drum and some personal items, had been stolen. Worst of all, the band's legendary backdrop, a 20-foot wide black banner that reads "D.O.A." in stark white letters, had also been stolen. "I yelled for our roadie. He came running around — you can imagine the expletives that came out of our mouths," Keithley recalls from his home in Burnaby, British Columbia. Nine months later, Keithley and Co.'s luck changed. Someone had "found" the backdrop and they would return it... for a fee. The morning after the theft, D.O.A. started putting their feelers out in the local music community. They wanted their stuff back, but most importantly, they wanted the backdrop. It had no real value to anyone else, Keithley says, and they wouldn't be able to ransom it off for a lot of money. In Keithley's own words: "You didn't steal the backdrop off the Rolling Stones." The banner was hand-stitched in a sewing circle in 1985, he says. At one point, it was sold to a club in San Jose, California, when the band thought they were breaking up. But that never happened, and the band managed to buy it back. "It had been with us ever since," Keithley says. In Spokane, Dusty O'Brien was hit pretty hard by the news: A touring band that he grew up listening to — one that he idolized — had possessions stolen while visiting his town, and his band Wasted Breath had opened for D.O.A. at the Pin the night of the theft. A couple days after the show, O'Brien and Keithley put out a call on social media to be on the lookout for the items. Every major news outlet in Spokane followed suit. D.O.A. was looking on Craigslist and making calls to local pawn shops, too, but "it was silence." In hindsight, all of the media coverage probably scared the thieves away, Keithley says. "We figured what was gone was gone," he says. And then he got a Facebook message saying, "Hey, I might have your backdrop." The messenger never claimed to have stolen the banner herself. But, O'Brien says, she claimed to have it in a storage shed. Her boyfriend was in trouble and they needed money, he recalls from the conversation. Keithley forwarded O'Brien the money, and he drove out to meet her with a couple of friends in early March. "She expected me to just hand over $500," O'Brien says. He didn't think they owed her anything, so there was going to be some haggling. Eventually, they agreed on $200. Without making eye contact, she showed him the backdrop, stuffed in a trash bag. They unfurled it in the parking lot just to make sure they weren't being duped. He reported her phone number and license plate to authorities, but they haven't heard anything since, O'Brien says. "Life goes on," says Keithley. At 62 years old, he isn't holding a grudge. When he talks to the Inlander, he's travelling to support the local Muslim community in Burnaby after a terrorist attack at a mosque in Christchurch, New Zealand. He says the band will come back to Spokane. He's just glad to be reunited with an important piece of the band's history. The original print version of this article was headlined "The Vanishing Banner"